This is plate two of Robert Melville Grindlay's 'Scenery, Costumes and Architecture chiefly on the Western Side of India'. 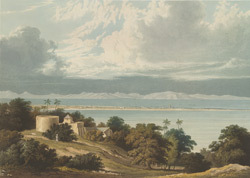 Grindlay (1786-1877) worked for the East India Company and was an artist in his spare time. During his stay in India he made a large collection of sketches and drawings. The approach of monsoon on the Western Coast of India, Grindlay writes: "is indicated by vast masses of clouds, which, for many days previous to the bursting of the monsoon, collect over the Ghats or Mahratta mountains, assuming an awful and threatening appearance. After a period of nearly eight months of almost total absence of rain, it descends with a violence unknown beyond the tropics, producing an effect ... which has the appearance of magic; the surface of the earth ... assumes, in the short space of three or four days the most brilliant verdure."